Paris is the most densely populated city in the world, housing more people per square mile even than Tokyo. You begin to appreciate this fact when you amble through the streets and note how little space (if any!) there is between parked cars. It becomes quite difficult to spot a car without battle scars. 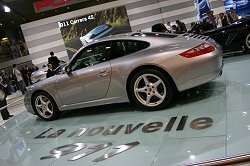 The Car Enthusiast travelled to Paris to wage a different kind of war: a full-on attack on the opening day of the 2004 Paris Motor Show. Le Mondial de L'Automobile, housed in the southwest of Paris was also densely packed, not only with scurrying journalists, but also with new cars and concepts. Of particular interest to the sportscar enthusiast was the first public showing of the new Ferrari F430 and Porsche Boxster. 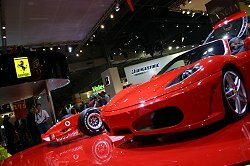 Ferrari's stand placed emphasis on the close relationship between the 360 Modena's replacement and the all-conquering Ferrari F1 car. In the metal, the F430 is a success. The curves are more complex than can be seen in photographs, and though I must admit to not being a fan of the Enzo-esque rear lights, the car taken as a whole is unmistakably a Ferrari; in my eyes, more so than the 360. It is interesting to note that Ferrari's design language on the F430 has moved a little away from form, towards function. The recently revealed 997 model Porsche 911 is another car that could never be mistaken for another make. The facelifted Boxster goes down the same path and, even side-by-side with the 911, was difficult to distinguish from its bigger brother. Saying that, I really do like the smooth new nose, which has a faintly retro feel to it. There is nothing old-fashioned about the wheelarch-filling alloys and huge brakes though. The rear ends of both 911 and Boxster are also bang up to date, with sharp new lights. The reduced size of the lights serves to emphasise the butch rear haunches of both cars, backed up by the huge rubber fitted as standard and twin-exit exhausts. Evolution may work for Porsche and Ferrari, but it was more a case of viva La Révolution on the home manufacturers' stands. 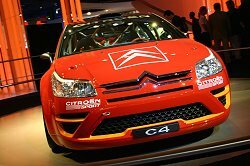 Citroen's centrepiece was of course the sporty new C4, looking for all the world like a serious Focus rival. The styling is certainly bolder than the new Focus (also making its debut in Paris), and we have been promised the dynamics to match. We found the 3-door particularly eye-catching in VTS trim, complete with large carbon fibre rear wing, echoing that featured on the stunning C4 WRC car also on display. It was all too easy to ignore the quirky facelifted C5 and the new C2 VTS, though we had the opportunity to drive the C2 VTS a week before the show, so we'll be bringing you our thoughts on that shortly. The Peugeot stand was vast, and so full of fresh metal that even the relatively new 307CC looked a little like old news. The 407 and distinctive 407 SW held centre stage alongside the clever new 1007. Its electric sliding doors are a joy to use, and its interior is thoroughly modern and flexible. Keeping the car enthusiasts happy was the display of the extravagant 907 sports car concept. The 907 is powered by a 6.0-litre V12 producing "around 500bhp", which proudly exhibits its intake trumpets under a see-through panel in the long bonnet. The luxurious leather, wood and Alcantara interior confirms the GT aspirations of the concept, though don't expect the 907 to ever see the light of a Peugeot showroom in production format. Across the aisle, Renault's stylish stand hosted its new small car, the Modus (already seen at the NEC this year) and the two recent concept cars: Wind and Fluence. The reappearance of the Wind in particular prompts us to suspect that a new small sports car is on the horizon from Renault. As Renault and Nissan now share components, perhaps it could be built on the platform of the fabulous 350Z coupe. The Roadster version of the 350Z made its European debut in Paris. Surprisingly, losing the distinctive roofline has not detracted from the character of the 350Z. It retains its bulky haunches and squat stance, along with the incredible attention to detail. The shaped soft-top cover ensures that the car maintains a cohesive design. Its driving dynamics should not be too shabby either. It is very likely that Alfa Romeo will reveal a facelifted 147 in Paris. We have scoop photographs below. There is an outside chance that the all-new 157 will make an appearance, but we are not certain of that. Surprisingly, Audi has already released details and images of its new A4 and A4 Avant, which will make its public debut at the show. Predictably, it shares the new full-length Audi nose with recently updated models, as well as the distinctively shaped rear lights. The saloon has a striking resemblance to the current Subaru Legacy saloon though, especially around the C-pillar. We will reserve judgement until we see the car for ourselves in Paris. Elsewhere on the Audi stand, we will be keen to try out the new A3 Sportback for size. The Chrysler/Jeep stand will have a host of new models shown in Europe for the first time, including the Jeep Cherokee Renegade, Chrysler 300C Touring and the Crossfire SRT-6. Being Citroen's home show, it should have a sizable stand. 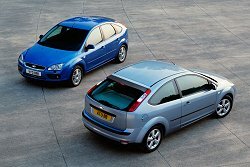 Cars of interest will include the odd, but facelifted C5, the sporty new C4 and the C2 VTS. One of the most exciting cars at the show will be the stunning Ferrari F430. I for one am looking forward to slipping into the driver's seat to try it out for size. The new-look Focus is an important car for Ford, and it debuts in Paris. Hopefully the awesome GR-1 concept will be on show too. Kia is quietly extending its range of vale-for-money cars throughout Europe. The launch of an all-new Sportage SUV in Paris should certainly boost sales. We expect to see the mildly freshened Maserati Coupe and Spyder in Paris, displayed alongside the MCC racecar and MCS road version. I know that the Mazda5 debuts in Paris, but we suspect that the Japanese company may have something else up its sleeve. Mercedes-Benz will have an exciting show display, with two concepts. The Vision R and Vision B offer a glimpse at two new Mercedes models due out in 2005. Also at the show will be the fantastic CLS 55 AMG. The MINI continues to sell in huge numbers thanks to minor tweaking of the range. The latest addition is a 210bhp version tagged Mini Cooper S with John Cooper Works tuning kit. Mental! 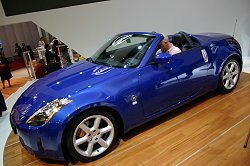 Nissan will display the gorgeous 350Z Roadster, confirmed for sales in Europe, alongside the sharp Pathfinder SUV. The Peugeot stand will focus on the innovative new 1007 mini-MPV, but no doubt most showgoers will drool over the extravagant 907 concept supercar. 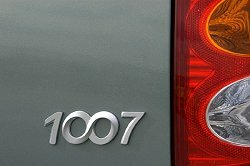 A sporty version of the 1007 will also be on display, designated 1007 RC. 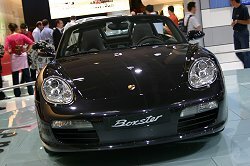 A new Porsche 911 and a new Boxster will ensure that the German stand will be swamped with people throughout the show. We hope to drive the 911 beforehand. Smart won't have any new cars on display, though the diesel and Brabus versions of the Forfour will make their debut. Over on the Subaru stand will be the new Legacy 3.0R spec.B sports saloon, aiming to steal buyers from Audi and BMW in saloon and Sports Tourer forms. Perhaps not as exciting as a new Porsche, but more significant to more people is the launch of a new Suzuki Swift, complete with distinctive styling and a promising specification. We are hoping for a Sport version in a similar vein to the excellent Ignis Sport. Our European counterparts know them as Opel, but we still get Vauxhalls on this island, and the Paris Show is the first outing for the sporty Astra 3-door and the Estate. The 3-door with panoramic windscreen will also be on show. The facelifted Alfa 147 was revealed in Paris, sensibly evolving the car's good looks with out detracting from them. Alfa Romeo will show a facelifted 147 at the Paris Motor Show next month. We have a sneak preview. The Vanquish S is the fastest Aston Martin in the company's history, and was shown to the public for the first time at the Paris Motor Show. Audi's new A4 debuts in Paris next week. We have been promised more driver appeal to back up its sharp new looks. BMW intends to have a production car ready in only a few years that will run on either petrol or hydrogen. In Paris, its intentions were clear with the appearance of the H2R record-breaking car, built to develop the technology as well as showcase BMW's efforts. We have a comprehensive gallery of photographs. Click on the image. BMW M5 debuts at 2004 Paris Motor Show: image gallery. 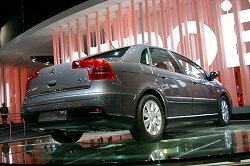 GM used the Paris Show to announce the replacing of the Daewoo brand with Chevrolet. Citroen's C2 VTS goes on sale in the UK this month, filling the gap left by the Saxo. Citroen's quirky C5 receives a much-needed facelift at this year's Paris Show. Ferrari's new F430 may have been no surprise, but the launch of a new Ferrari is always an exciting day. With the debut of the Focus-based Vignale concept, Ford joins the Coupe Cabriolet brigade with style. Kia continues to expand its model range. The next car to appear will be based on the Sport concept shown in Paris. Eleven years after the introduction of the original Sportage, Kia has finally announced a fitting replacement, firmly moving the car more upmarket. To keep sales of the Coupe and Spyder alive in 2005, Maserati have freshened the range. The changes are small though, as an all-new car is on the horizon. It may not look like it, but this Mazda6 MPS is a rival for Mitsubishi's Evo and the Subaru Impreza STi. The Mazda5 is a serious attempt at breaking the mid-size MPV market. It will be on display at the 2004 Paris Motor Show. The Mini Cooper S Works now packs a bigger punch thanks to various tweaks on air flow and engine management. The £2,999 upgrade now bestows the Works with 210bhp reducing the 0-60mph time to 6.6 seconds and increasing the maximum speed to 143mph. The 6,000 existing owners will be able to upgrade for around £350 plus an hour's fitting. Nissan's new Tone family car debuted in Paris and will be made in the UK. Nissan's gorgeous 350Z looks even better without its roof. The Roadster is coming to the UK and debuts in Paris. The sharp Pathfinder and sleek Murano SUVs will be displayed at this year's Paris Motorshow. Porsche has disclosed the first official details of the forthcoming 911 replacement, the 997. As has become the norm in its 40 year lifespan, the new model sees an evolution of the 996's styling with no radical departures. Renault will unveil the Megane Trophy racecar at the Paris Show. We think it will spawn a new limited edition road car. 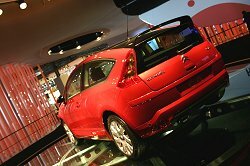 Renault will launch the latest Renaultsport Clio at the 2004 Paris Show. The 182 Cup is a (marginally) lighter version of the popular hot hatch. Its chassis has been stiffened considerably for a more focused drive, which may also explain the stripping back of standard equipment to a minimum. The good news is that the £13,800 price tag includes the Cup Suspension and Spoiler packs as standard, which adds up to a saving of £1,295 over the standard car. The pictured car is in the new 'Inferno' colour. Skoda launched the new Octavia estate in Paris. The new model is the second in the new Octavia line-up alongside the hatch variant that went on sale in July. Looking to build on the virtues of the brand, the Octavia offers the now familiar recipe of roominess, quality, comfort and value for money. A 4x4 version will also be offered, further enhancing the car's versatility. Also unveiled in Paris was a facelifted Fabia. Subaru has unveiled a new range topping 2.5-litre turbo version of the Forester. Wielding a 211bhp axe this new version is capable of 0-60mph in 6 seconds whilst, courtesy of 236lb.ft of torque, retaining its tremendous 2 tonne towing limit. Visual changes are new 12-spoke alloys and a new range of exterior colours. The interior receives new sports seats and a Momo steering wheel. Priced at £24,695, the XT goes on sale in the autumn. Subaru's Legacy is a bargain sports saloon with a real racing heritage. The 3.0R spec.B version debuts in Paris this year. Suzuki aims to have a larger part of the small car market, and launches a funky new Swift at the Paris Show for that reason. Ahead of its Paris Show debut, Vauxhall has released details of the sporty new 3-door Astra. The High Performance Concept Astra revealed in Paris points the way towards a very promising VXR Astra. VW's much-hyped new Golf GTI will be revealed in Paris. Buyers can order the car online now though.